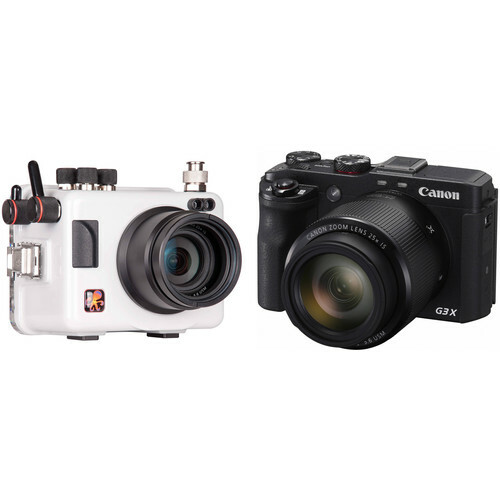 Want to capture brilliant photos and Full HD 1080p video beneath the water's surface? The Ikelite Underwater Housing with TTL Circuitry and Canon PowerShot G3 X Camera Kit from B&H enables you to do just that--at depths as great as 200'. Bundling the durable waterproof enclosure with the advanced, 20.2MP, super-zoom point-and-shoot digital camera, this package provides everything you need to embark on an underwater photo or video adventure. The housing includes a flat port designed for use with the camera's lens at its widest 24mm focal length, and accepts an optional macro port for shooting at the 100-135mm telephoto end. It's recommended that you grab a strobe or video light to ensure sufficient illumination and color accuracy on cloudy days, and when diving beyond 20' or so on clear, sunny days. Capture images and video at depths up to 200' beneath the surface with Ikelite's Underwater Housing with TTL Circuitry for the Canon PowerShot G3 X Digital Camera. Built-in, proprietary circuitry and an Ikelite bulkhead connector allow for TTL exposure with optional, external Ikelite DS Substrobes. Non-Ikelite strobes are compatible in manual mode. Dual fiber-optic cable ports built into the housing provide an alternate method for strobe attachment. Ergonomic mechanical controls, including push-buttons, knurled knobs/dials, and a lever, afford access to all camera functions except for the framing assist-seek button, manual focus button, zoom lever, and front control ring. Built for durability, the enclosure is made in the USA from a corrosion-resistant ABS and polycarbonate blend, which is white/light gray on the front, sides, top, and bottom but clear in the back to allow you to monitor the O-ring seal and rear camera controls. The housing ships with a flat lens port designed for use with the camera's lens at its widest 24mm focal length. Since the flat front element magnifies the image and reduces the effective angle of coverage to a degree, the optional WD-3 Wide Angle Dome is a recommended add-on. As an alternative, the housing accepts the optional 135mm Macro Port for use with the 100-135mm telephoto focal lengths of the camera's lens. Box Dimensions (LxWxH) 8.8 x 8.3 x 6.3"